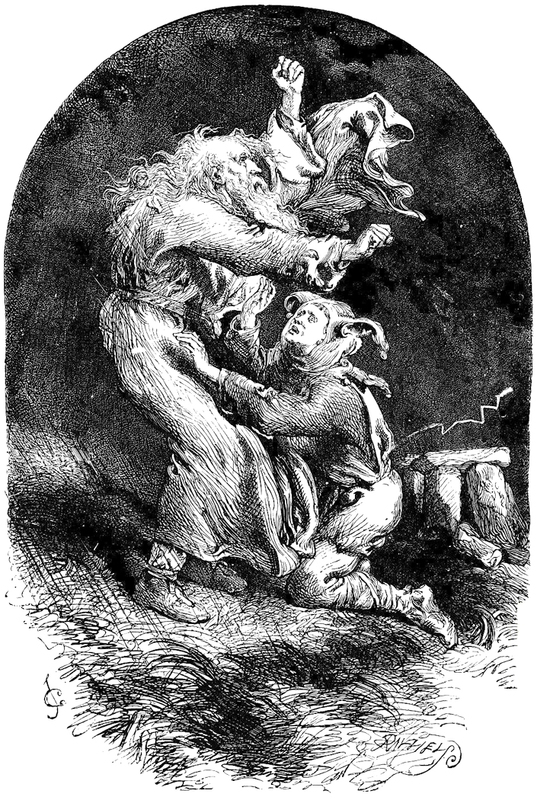 It is an hour or less before the setting of the sun, a shadowless moment already greyed out, with an evenness of tone across the landscape, and it has begun raining, a heavy downpour, a late summer evening drenching. I first hear it, and drawn to the door, I look out and watch. 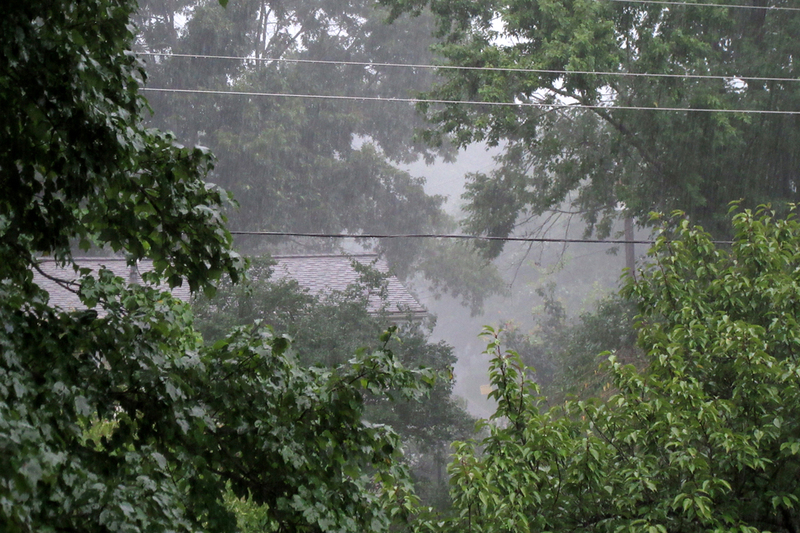 It is not just the rain, coming down in parallel lines across the trees, but the sudden humidity, a thickness in the air, and a kind of cool warmth — the air being cooler than the daytime, but the mugginess felt as summer heat. The drops splatter on the pavement outside the house and bounce up as they explode, making a kind of haze above the ground. 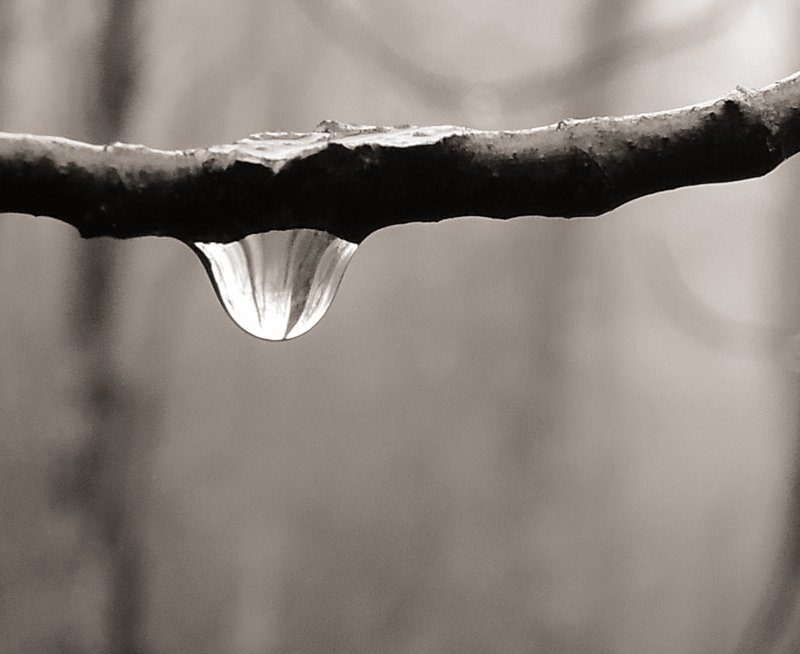 It is a multi-sensory event: the hiss of the rain, the sight of the shower diagonal against the trees, the feel on the skin and the damp in the nostrils. As the weather develops, there is distant thunder. It rolls rather than claps. 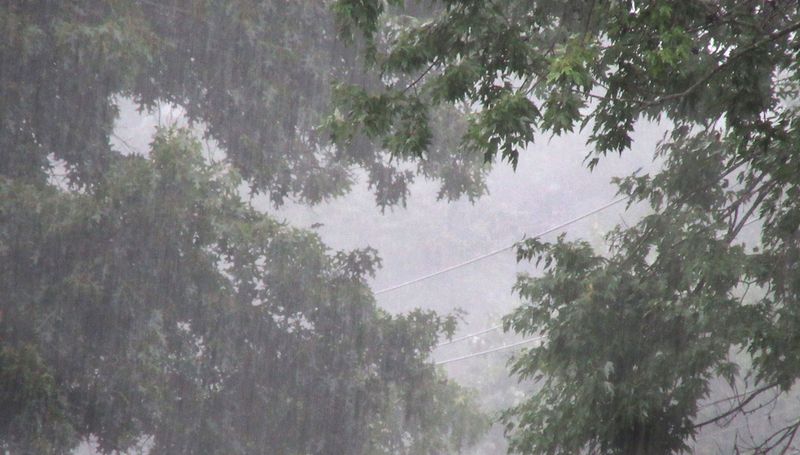 And the presence at my door cannot help but expand beyond this afternoon and its downpour. I am 70, and there are seven decades of familiarity to the rain. This moment and the emotion I feel watching is a palimpsest of all those years — each time it has rained, overlapped one on the other to make not a single day’s weather, but a book of pages, each another storm, bound in morocco to make a life. As a boy, growing up in what was then rural New Jersey, a brook ran through our yard and when it rained, it would flood, rushing down its channel the color of chocolate milk. As a Boy Scout, there were camping trips in tents made from heavy oiled canvas duck, with no floors, and in the rain, the heavy drops would splatter through the weave and spray us as we tried to sleep with a mist. Later, in summer camp and living in large tents on wooden platforms, the rain would make a sizzle on the canvas that was pleasantly soporific. In my 20s, trying to hike the length of the Appalachian Trail, rain would sometimes keep us sheltered in a lean-to to wait out the weather, and after a night of downfall, we would wake up to a glazed world with leaves dripping, wet and clean, into the earth below and the long curved stamens of the rhodora flower weighted with a single bead on each tip. In Oslo, Norway, it rained every day in the summer at 4 p.m. You could almost set your clock by it. The downpour lasted perhaps 15 minutes and then it stopped, leaving streets running and the sound dampened by the humidity. In South Africa, we were almost stranded on our way to Eshowe in Natal Province in 1987, when heavy rains washed out the John Ross bridge over the Tugela River. Eventually, our bus crossed the river on a railway bridge a few miles north. And, of course, I lived in Seattle for a while. The city is famous for its rain, but unless it was a gully-washer, no one even noticed. The constant winter mizzle was considered by most of the populace as fair weather. Or fair enough, anyway. Once, traveling across the continent, my wife and I were camping in Shamrock, Texas. In the middle of the night, a storm and tornado struck. First, our tent began floating as the drainwater created a flash flood, and then, when we abandoned the tent to find more secure shelter, the wind grabbed the tent like a kite, and I stood there, lit by the lightning, holding onto the airborne canvas trying to keep it from blowing off to the next county. I managed to get it caught under the tin roof of a picnic table and was able to dismantle it in the torrent. 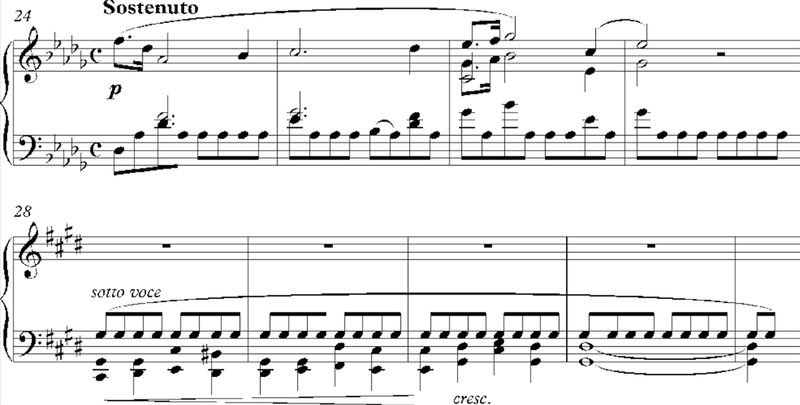 There’s the thunderstorm in Beethoven’s Pastoral Symphony, the wind machine in Strauss’s Alpine Symphony, and Chopin’s “Raindrop” prelude. 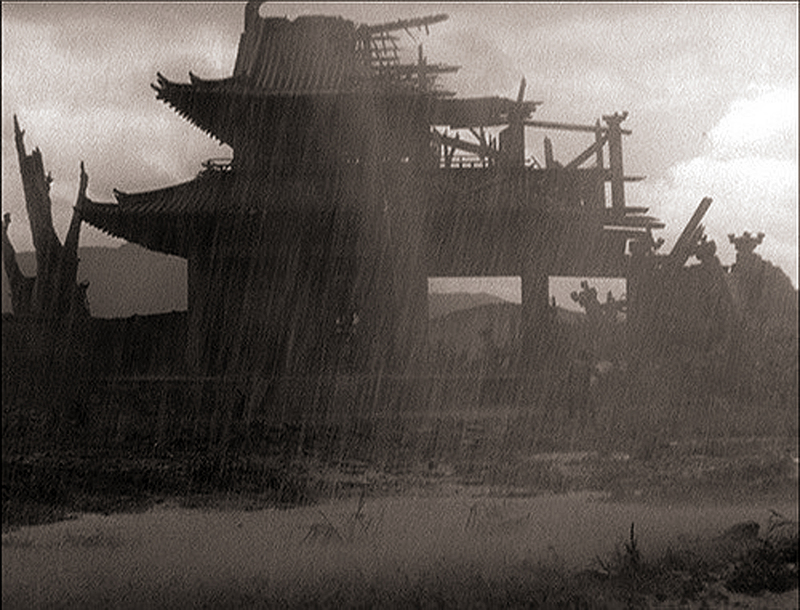 There’s the downpour that begins Kurosawa’s Rashomon and the hurricane in John Huston’s Key Largo. 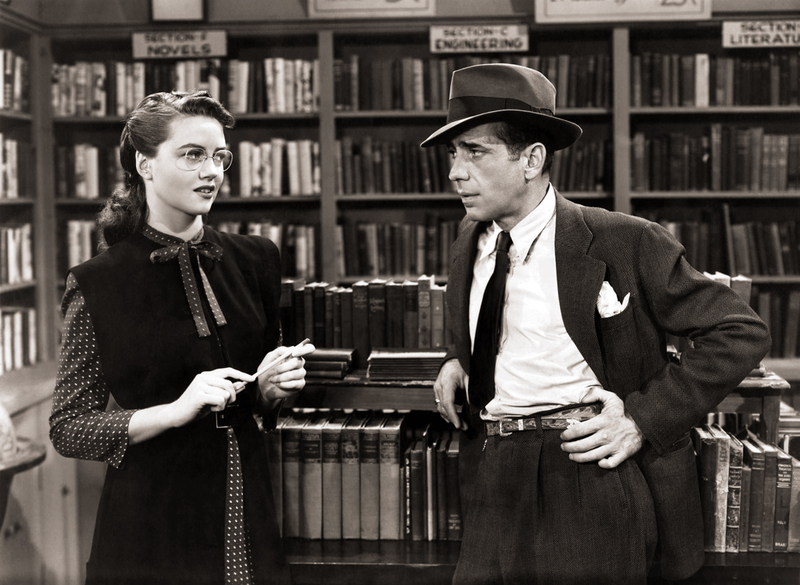 The shower in The Big Sleep, when Humphrey Bogart ducks out of the rain into the bookstore with Dorothy Malone — when I first saw the film on television as an adolescent, the scene counted as pretty racy stuff. Looking out my door now, the trees across the road are a grey mass, not a boring cardboard grey, but a rich, charcoal and velvet grey, a grey made up not of a lack of color, but of all the colors veiled over each other. 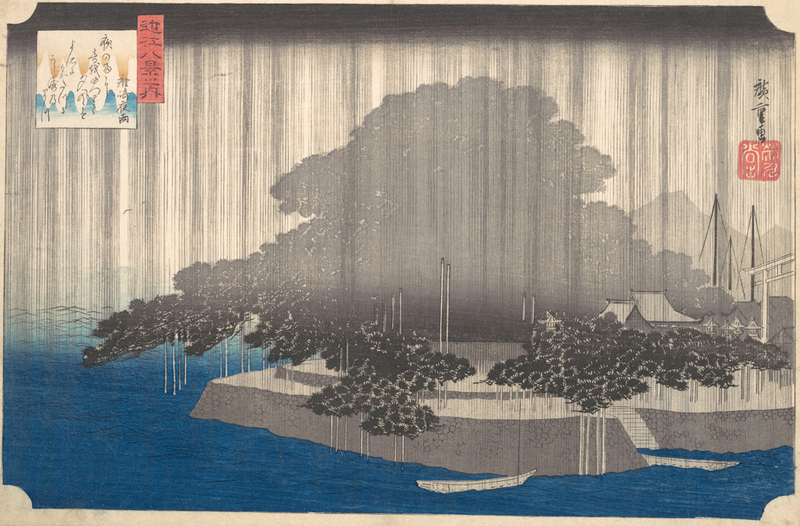 The visual poet of such rich greys in the rain is the Japanese woodblock artist, Ando Hiroshige. 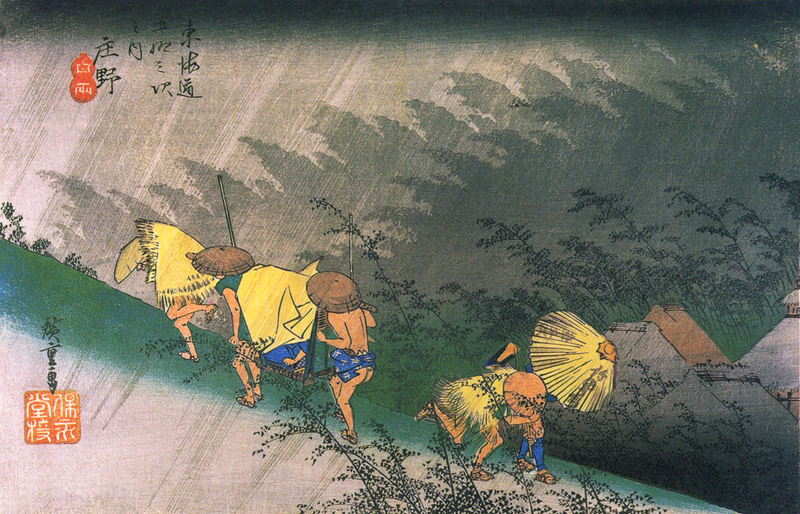 In so many of his Ukiyo-e images, the rain has dulled the contrast of the trees, leaving them a blank wash of charcoal or slate. 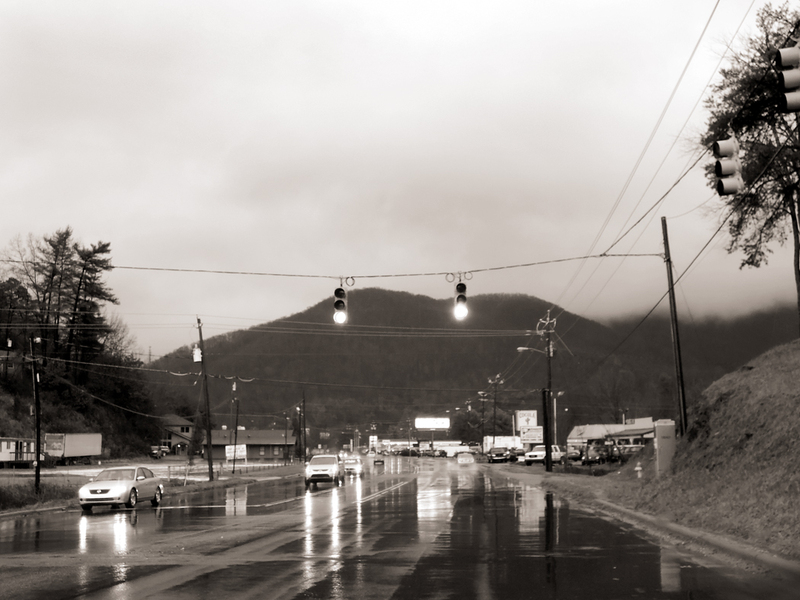 It is what I see across the road — the overlapping of ever lighter greys as the landscape recedes. In 20 minutes, it is over. 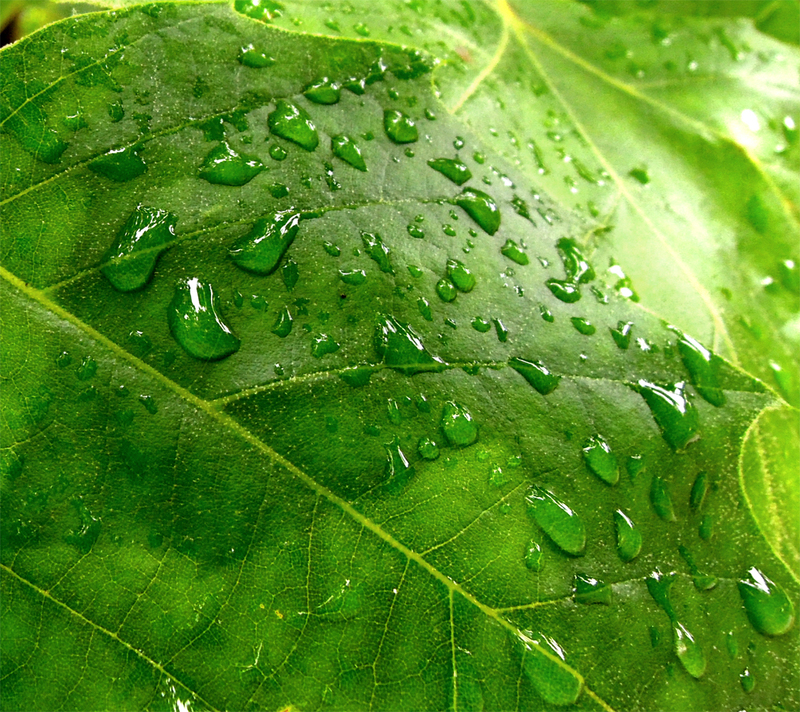 The street is flowing with runoff, more leaves have blown from the trees and collect in the wash along the curb. Fall is not too far off. The sky is barely brighter than the silhouetted trees; night will be here in another 10 minutes. Aprill with his shoures soote cannot match the end of summer and its late afternoon drenches. Trees all leafed out are ready to give up and let go. A certain exhaustion can be felt in the air; we have pushed so hard into the growth and flowering, and in seed time, we recognize our day is over. I close the door; the rain is forgot. I am remembering it now — emotion recollected in tranquility. I recall to mind the humidity on my skin, the sound in my ear, the riot of greys and the street wash. 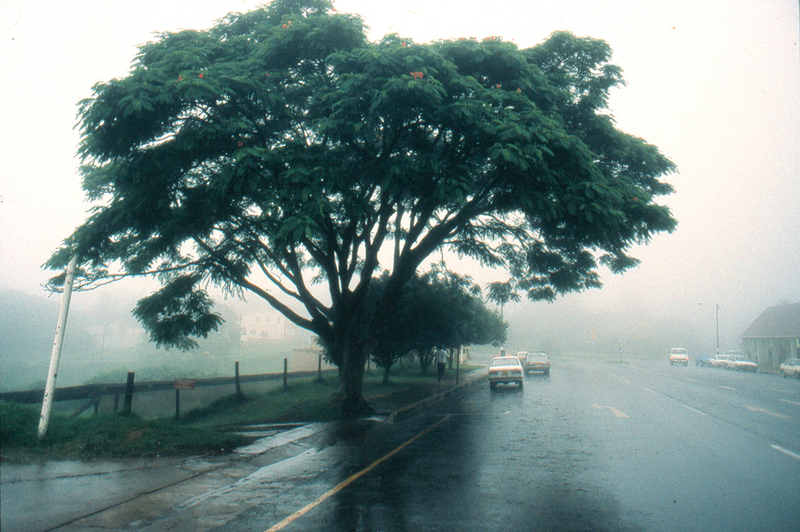 I love the rain; it is infinitely more beautiful than sunshine, which blares and obscures in shadow. The forms of things are revealed in sunless weather that are obliterated by sunlight. You see the world the way it truly is, not split into a manichean dichotomy of bright and dark — of Ahriman and Ormazd. How cruel to write of all that lovely rain, when we here in Downeast Maine are praying for even the slightest shower!